“Since the end of the cold war in the late 1980s, the sense of crisis has become ubiquitous. Media discourse around terrorism, climate change disasters, global financial collapse, and impending pandemics inspire apocalyptic fiction and fictional narratives of disaster feed into risk reporting. At the same historical moment, comics as a medium, particularly in the English-speaking world, turned towards bleaker, more dystopian and complex narrative worlds, Alan Moore’s Watchmen (1986-87) and Frank Miller’s Dark Knight series (1986, 1987, 2001-02) being the most prominent early examples. 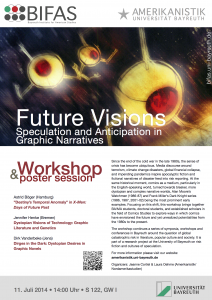 It is not surprising, then, that dystopia has become one of the dominant genres (next to autobiography) in comics/graphic narratives, while utopian visions have virtually disappeared. Even the superhero has turned into a figure of doom rather than resurrection. You may direct questions and comments directly to the workshop organizer and ComFor member Laura Oehme!